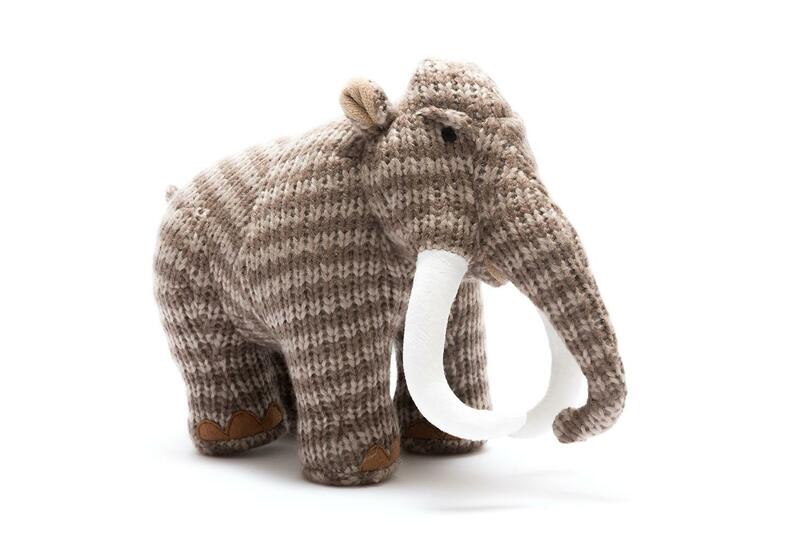 Our gorgeous Woolly Mammoth toy comes in tactile knitted brown stripes with soft tusks . A soft, cuddly and substantial knitted toy, capturing the sturdy appeal of the pre-historic Woolly Mammoths. If you are looking for dinosaur toys for toddlers, why not consider a woolly mammoth? Dimensions can vary and are given as a guide only. As with all our toys he is suitable from birth and tested to EN71 and CE. Best Years are a soft toy manufacturer based in the UK. All of our knitted dinosaur soft toys are available to wholesale, retailers and museum customers. Have you seen our Woolly Mammoth Greetings Cards?